Fermi Large Area Telescope (LAT) provides an unprecedented view of the sky in gamma rays. 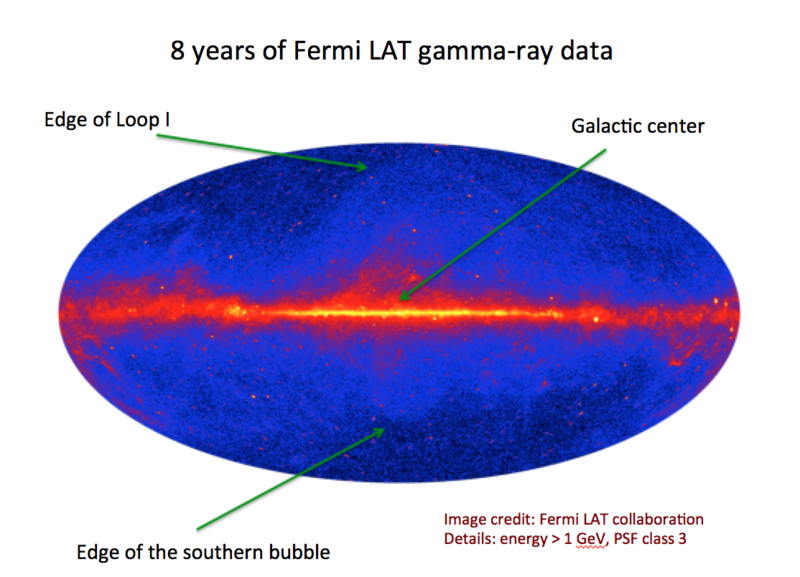 There are several large scale features visible in the gamma-ray data, such as the Fermi bubbles (one can see the edge of the southern bubble in the map to the left) and Loop I (clearly visible in the northern hemisphere). There is also a tentative excess of gamma rays near the Galactic center, which is hard to see in the gamma-ray data due to large foreground emission in the Galactic plane. Study of the morphology and spectrum of the bubbles near the Galactic plane (together with Laura Herold – currently a master student at FAU). Laura’s bachelor thesis on the low latitudes emission from the Fermi bubbles: ECAP-2016-047. 2. Near the Galactic center the Fermi bubbles are intertwined with the tentative excess of GeV gamma-rays around the Galactic center itself. I was one of the leading authors on a recent Fermi LAT collaboration paper about the Galactic center GeV excess, where we have argued that modeling of the Fermi bubbles near the GC is one of the main sources of uncertainty about the GC excess, as well as the modeling of point sources, sources of cosmic rays near the GC, and distribution of gas towards the Galactic center. 3. Loop I is the largest feature in the gamma-ray sky, which is also easily identifiable in the radio and X-ray data. 4. Gamma-ray emission from M31. Andromeda galaxy (M31) is one of the closest galaxies to the Milky Way. Diffuse gamma-ray emission has been detected from M31 (Fermi LAT paper on M31). Surprisingly, it does not seem to be correlated with the distribution of the gas, which is expected for a Milky-Way like galaxy, where the majority of gamma rays are produced by interactions of cosmic rays with the gas. We are working with a bachelor student Paul Lehmann on possible interpretations of the gamma-ray emission from M31. Another big subject of my current research is application of advanced statistical and machine learning methods to analysis of point sources. 1. Search for individual primordial black holes in Fermi LAT data. This is a joint project with Stefan Funk, Steven Ritz, and Christian Johnson. The paper is now in the internal review of the Fermi LAT collaboration. Here you can find information about students that I’m currently working with or have worked in the past. Giacomo Principe (current) – wavelet analysis of point sources. Laura Herold (current) – analysis of the Fermi bubbles at low latitudes. 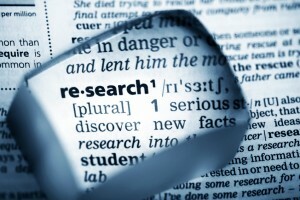 This is a continuation of Laura’s bachelor thesis work. Dominic Bernreuther (current) – sensitivity study of CTA to detect Fermi bubbles. 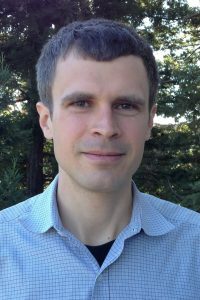 Paul Lehmann (current) – analysis of gamma-ray emission from Andromeda galaxy. Laura Herold (Summer – Fall 2016) – “An Analysis of the Fermi Bubbles at Low Latitudes” ECAP-2016-047). Judith Höffer (Spring – Summer 2016) – analysis of the base of Loop I near the Galactic plane (around 30 degrees in longitude). Thesis title “Analysis of an excess flux of gamma rays at 30 degrees in longitude in the plane of the Milky Way galaxy”, ECAP-2016-018. Winter – Spring 2017 – visiting PhD student at ECAP, FAU. We worked on a characterization of systematic uncertainties in the analysis of the spectrum of supernova remnants due to imperfect modeling of diffuse foreground gamma-ray emission in the plane of the Galaxy. July – September 2012 – visiting summer student at SLAC, Stanford. We worked on spectral fitting of gamma-ray data at different positions on the sky. We have found that the diffuse gamma-ray emission in the Galactic plane within about 50 degrees from the Galactic center is harder than at other locations along the disc, which is most likely due to harder spectrum of cosmic rays in that region. Spring – Summer 2017 ECAP, FAU – Introduction to Astroparticle physics (together with Idan Shilon)- lectures and problem sessions. Fall 2015 – current, ECAP, FAU – Student Journal club (together with Idan Shilon) – discussion with students of current publications in astrophysics. There have been a few iterations of the format of the class. Now we meet just before the ECAP seminar and students present papers that can serve as an introduction to the topic of the seminar. The seminar speaker is also invited to the journal club. Winter 2016 – Winter 2017, ECAP, FAU – Z0 boson decay advanced lab – a two-day lab that uses legacy LEP data to determine the mass and lifetime of the Z0 boson. The lab was developed by Kathrin Valerius when she was at ECAP. 2003 – 2008, Princeton University. Teaching assistant for various undergraduate and graduate courses, including, Classical mechanics, Quantum mechanics, Particle physics, String theory, as well as different labs for undergraduate students. 2002 – 2003, Moscow State University. Teaching assistant for a Quantum field theory course. “The Fermi Galactic Center GeV Excess and Implications for Dark Matter” – this was a long project that involved a lot of people in the Fermi LAT collaboration, including Anna Franckowiak, Luigi Tibaldo, Andrea Albert, Eric Charles, Elliott Bloom, Seth Digel, Toby Burnett, Mattia Di Mauro. One of the main goals was to test how modeling uncertainties affect the properties of the GC excess. We also put limits on DM annihilation from the observation of the GC. In some channels, e.g., tau – taubar, the limits at high energies are significantly better than the limits from the dwarf galaxies. “The Spectrum and Morphology of the Fermi Bubbles” – the work done in collaboration with Anna Franckowiak and Vahe’ Petrosian. Here we present a rather detailed analysis of the Fermi bubbles using different diffuse emission models as well as a derivation of the bubbles using Spectral components decomposition. We confirm the approximately uniform gamma-ray spectrum at latitudes above and below 10 deg. We also provide interpretation of the gamma-ray emission in terms of leptonic (inverse Compton) and hadronic (pi0) components. “Spectral components analysis of diffuse emission processes” – this is a paper describing the spectral components decomposition method. This is a generalization of the internal linear combination (ILC) method used by WMAP collaboration to separate the CMB map from the Galactic foreground emission components using only the spectrum of the CMB.